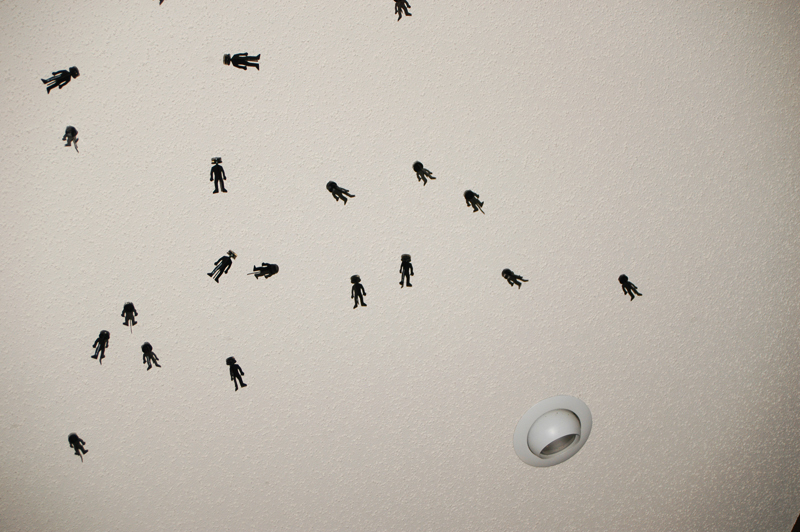 I tried counting the men on my ceiling. Yep, still there and very firmly attached. So I tried to count them this morning. I kept getting different numbers. It’s somewhere in the neighborhood of 60-70 men. That’s really way more men then I need. At least they’re well behaved. The garage door repair man came and had some really weird looks, but was not brave enough to say anything.Thad was going to try and pull them down so he could win the 48 hour bet that they would come down. But then he said Tony would win because he said someone would have to pull them down. They’re like my own little Verizon network. Leave a comment	| tags: behaved, count, leg, men, network, three, verison, well	| posted in am i still here? I need more three legged men. Yeah, I need to make a t-shirt out of that one! So. 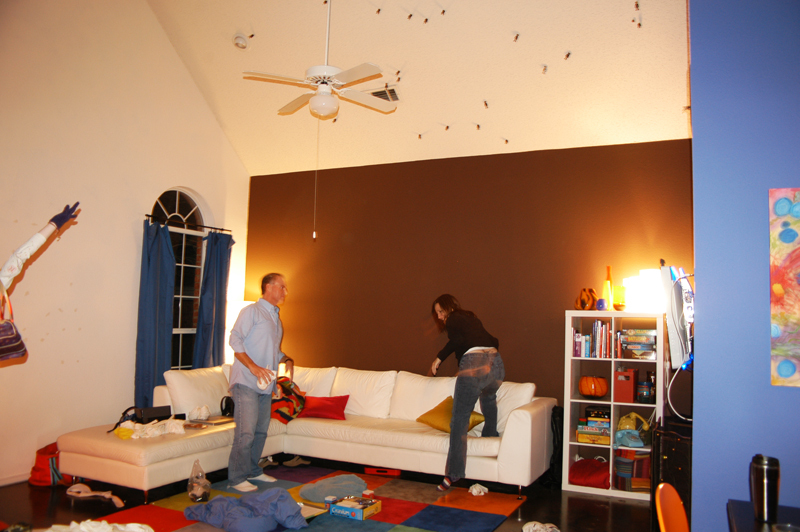 I had some friends over and we threw all these little promotional men thingies with sticky heads all over the house. It was a blast! 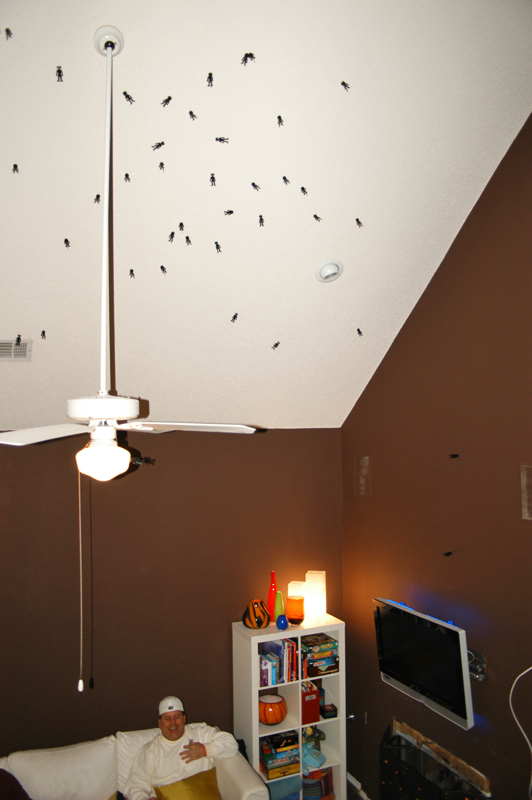 When you throw them at the wall, they stick but eventually fall off. 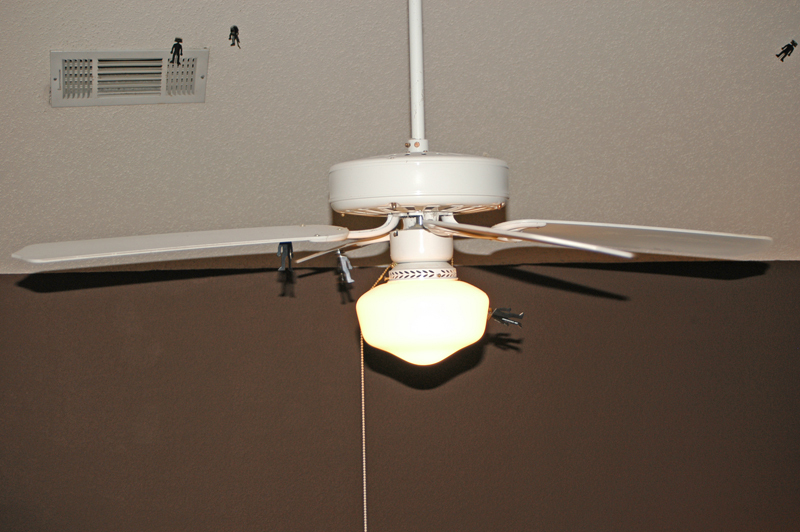 So who would have ever thought that they would stick to the stupid popcorn ceiling? Like PERMANENTLY. Oh well, one more conversation piece for the Wissing funhouse. This is what happens when you have creative friends, a broken key on your PowerBook and a spare 5 minutes. So just messing around with Jerod’s broken laptop… we thought, “Hey?! Wonder what the old keys would look like with the new lit PowerBook? ?” So it started. We changed out the ‘:’ key that keeps popping off. It looked cool, so then we had to switch out one of the Apple keys. Then Jerod said, “We have to switch some of the letters too”. So he choose 8 letters that spell three words. (Thus the ‘3’ key that I switched out) Can you guess the three words? Letters may be used multiple times. I’ll post the answer in a few days. Unless of course someone gets it.